Okay, so maybe he won't be the American League MVP, but Red Sox second baseman, Dustin Pedroia, sure is making it difficult for voters. Between Pedroia, teammate Kevin Youkilis, southsider Carlos Quentin, Ranger Ian Kinsler, and former MVP, Twin Justin Morneau, the MVP race in the American League is as difficult to figure out as it's ever been. Oh, wait . .Did I forget to mention Angel closer, Francisco Rodriguez, whose about to toss a record setting number of saves? Rangers second baseman, Ian Kinsler, probably would have been a front runner in the 08' A.L. MVP race, if not for the fact that he plays for the Texas Rangers. While fellow Ranger All-Stars, Josh Hamilton & Milton Bradley get significant hype, Hamilton for his story and Bradley for his B.A. (hitting .329 through September 1st) it's possible to assume that if Texas had been in contention for a playoff spot longer, Kinsler would have been the proverbial lighting rod. Ian Kinsler has scored 102 runs, clubbed 18 home runs, and knocked in 71 runs with a month remaining. The Rangers infielder has been caught stealing only twice in 28 tries and has a better than average .375 on-base percentage. Hitting nearly .320 through September 1st has kept Kinsler in the MVP conversation. But like I said before, with the Rangers sitting 17.5 games back of the first place Halo's and four wins under .500, Kinsler won't be considered much longer. Sidenote: Do the Rangers ever question why they have guys like Ian Kinsler, Milton Bradley, Josh Hamilton, Michael Young and even when they had Mark Teixeira, how they don't move forward as a franchise? I know great pitching is hard to come by, but even a blind squirrel finds a nut some days. Sure, Dustin Pedroia is making his case as we speak, but for the last five months no one has done more for the wild-card leading Red Sox than first baseman, Kevin Youkilis. 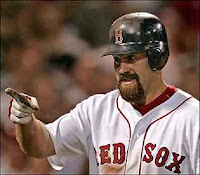 A career-year for Youkilis, in 125 games the former third baseman has pounded 24 homeruns and brought in 94 RBI's. Only White Sox outfielder, Carlos Quentin is slugging better (.571 compared to Youk's .560) among MVP candidates. From batting lead-off to batting seventh, Kevin has hit in all spots for the Red Sox, maintaining a .387 OBP. The greatest tell tale sign of his value to the Sox may just be in something they DIDN'T do. With Manny Ramirez clearly on his way out of town, post All-Star break, the Sox didn't pursue at the time Braves first baseman, Mark Teixeira. Teixeira would have been the obvious tool to replace SOME of the numbers & protection that Ramirez provided and would also take the place of Youkilis at first base. Part of me believes, of course the Red Sox unwillingness to part with premier young pitching, but coupled with that, to create a log jam at first would present other problems for the Sox, and the excellent season Youkilis was giving them. Kevin Youkilis is hitting .315 and has been among the league leaders in average all season long. K-Rod, Halos closer, Francisco Rodriguez. Preface this with, if your not going to give Pedro the MVP in 1999, (313 Strikeouts, 23-4, 2.07 ERA in 213 innings) I'm hard pressed to give any pitcher the award. Yet in 2008, Francisco Rodriguez is making a solid case to be that pitcher who receives MVP consideration. Aside from defining the term Contract Year, Frank Rodriguez has been unhittable. Striking out 68 hitters in just 59 innings and allowing just 16 runs all season long. The Angel closer has an era of 2.43 while converting 54 of 59 save opportunities, and as you know this puts him four saves shy of Bobby Thigpen's 18 year old record. With six more saves not only would Rodriguez hold the single season record for most saves in a season, he'd also be responsible for placing the final nail in more than 60 of the Angels league leading 90 wins. Is the fact that Rodriguez is responsible for at least getting the final three outs of two-thirds of the Angels victories not MVP like? Then again, Pedro circa 1999 was more dominant than any starter possibly EVER! If they get in, it's theirs. Chicago White Sox outfielder, Carlos Quentin, has had an amazing 2008. If Chicago's "other" team reaches October alive, it'll be in large part due to the American League leader in homers, Carlos Quentin (36). Currently, Quentin is among the A.L. 's top five in homers, slugging %, and runs batted in. With40 at bats less than Twins All-Star, Justin Morneau and nearly 90 fewer AB's than possible front runner, Dustin Pedroia, Quentin has elite power. Placed in a lineup with fellow slugger Jermaine Dye and that recently added future Hall of Famer, Ken Griffey Jr., Quentin's power hasn't tailed off all season long. For voters, it may take the White Sox winning the American League Central, and in turn, advancing to October, for Quentin to achieve the MVP. For us, it's hard to ignore Quentin's .312 average since the All-Star break, all while his team is making another run toward the post season. Makes you think if the offensively challenged Arizona Diamondbacks would re-think dealing the young outfielder last December. 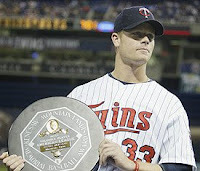 Surprisingly, this isn't Twins first baseman Justin Morneau's first MVP campaign. The 2006 MVP and reigning Derby champ, has been down this road before. Two years ago Morneau beat out the likes of Derek Jeter and David Ortiz for the American League MVP, and with a month left in the season, he again poses the biggest threat to American League pitchers. A Twin team that dealt prized lefty, Johan Santana, in the offseason and allowed outfielder Tori Hunter to walk in free agency, is back in the hunt again and their lead by none other than British Columbian born Justin Morneau. The first baseman has blasted 21 homers and driven in 109 Twins, if not for the mind numbing first half of Josh Hamilton, he'd be leading the American League. His numbers are down since his first MVP campaign (34 Homers, 134 RBI's) but with a month remaining Morneau could be knocking on those doors again. Morneau has been almost injury free for the entire season playing in 138 games, more than any of his closest competition. Is it possible we could have a more unnoticeable two-time MVP? Definition of a "Gamer" . . . .Red Sox second baseman, Dustin Pedroia. Am I a homer? You bet. This however, is about what happens in between the white lines, for 162 games. The wild-card leading Red Sox have placed David Ortiz, Mike Lowell, and J.D. Drew on the DL in 2008. They've sent Manny Ramirez to Chavez Ravine, otherwise known as Los Angeles, and currently have baseball's 4th best record. Not many teams can afford to lose three to four sluggers for significant time and not feel it, then again, not many teams have a 5'7 " second baseman whose hitting .330 and batting cleanup. That second baseman has knocked in 8 runs, hit two homers, and is hitting .615 over the past three games. A small sample? You can take the 76 RBI's and 17 home runs over the last 136 games if you'd like. Pedroia tops all competition for MVP with 110 runs scored and for a guy who is supposed to have "questionable speed", he's only been caught stealing once in eighteen tries. How about his defense? Compared with Ian Kinsler, fellow second baseman and MVP candidate, whose made 18 errors in 700 chances, it's no question. Pedroia has been playing gold glove defense this season, converting 85 double plays and just six errors in 633 total chances. On a team with a staff that has lost Schilling to retirement, Wakefield & Beckett have spent significant time on the DL, and seen Clay Buchholtz go from a promising young pitcher to a pitcher with an ERA close to 7.00, Pedroia's defense has been rock solid. The Arizona State alum crushed a back breaking grand slam at "The Stadium" last week, put away the Orioles by slapping a two-out, two-run single in the sixth on Labor Day, and got the Red Sox on the board with a solo shot in the seventh today. The things you do in September determine if your playing in October, judging by what Pedroia has been able to to do, the Sox are headed to yet another post season. My definition of an MVP? Dustin Pedroia.